Uefa will make a decision on Poland and Ukraine's ability to stage the 2012 European Championship in September. The European governing body has already told the hosts they need to speed up work on building stadiums and improve roads and transport infrastructure. 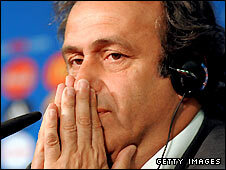 President Michel Platini will head an inspection next week, though he insists there is "no back-up plan" in place. Uefa also indicated it will increase participation from 16 to 24 teams in future tournaments, starting from 2016. Italy was widely expected to win the Uefa vote when it was announced in Cardiff in April 2007, with another joint bid from Croatia and Hungary also in the running, and Platini was forced to deny that Italy had been earmarked as replacements. "We'll do everything we can to hold it in Poland and Ukraine," he said. "We have never had any second thoughts or other thoughts and we respect our decision to go to Poland and Ukraine. "The only thing which would make me decide not to go is if there is no stadiums in the capitals, Warsaw and Kiev. If there are no stadiums there, no tournament." Excited about the potential prospect of 24 teams at Euro 2016? Poland and Ukraine, who were awarded the competition in April last year, have admitted that preparations had fallen behind because of political instability in both countries. Work has not started on the new stadium in the Polish capital, while contractors have not yet been appointed for the major refurbishment of the Olympic Stadium in Kiev. Uefa will make its next announcement on the subject at a meeting on 23 September - where it will also formally decide whether to increase the number of teams competing in the finals from 16 to 24 from 2016. The idea was unanimously agreed by senior officials of all 53 UEFA member nations on Saturday after the recommendation was made at a meeting of the presidents and general secretaries of UEFA members. The proposals were first submitted by the Scottish and Irish FA last year and Platini insists that increasing the size of the tournament to 20 or 24 teams from 16 finalists would not necessarily diminish the quality of the competition. "Remember, I won the Euros [in 1984] when there were only eight teams," he said. "It is not certain it was better with eight teams than 16 or that 16 is better than 24 or 32 or 54. "I am not worried about the quality by increasing the number of teams. Countries like England, Denmark, Scotland, Ireland, Belgium, Serbia, Ukraine and Bulgaria all have the ability to participate in a European Championship."